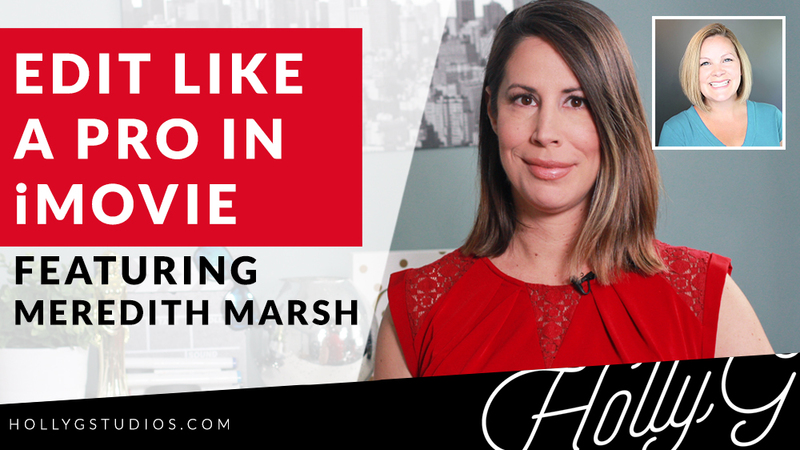 I have always been a big believer in researching video topics before creating the videos, in an effort to make sure your videos are viewed by as many people as possible. So when I heard about a new keyword tool for YouTube, I was excited to check it out! 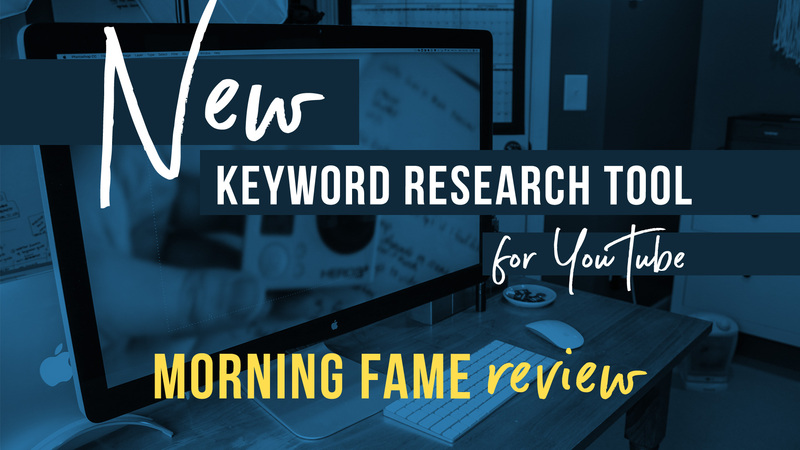 This post isn’t the most in-depth Morning Fame review, but I do cover what I love about this keyword tool for YouTube and why it’s a game changer for YouTubers. This post contains affiliate links, which means some outbound links are traced back to me. When I share these kinds of resources, it means I may earn a commission or compensation for sharing. You know that creating videos takes time. Even a talking head video like this one will take several hours to create–researching, planning, shooting, editing, and publishing. Abe Lincoln famously said, “Give me six hours to chop down a tree and I will spend the first four sharpening the axe.” Although it’s a similar situation for creating YouTube videos, it may not be a one-to-one comparison… but you should be spending a significant chunk of time researching your topics before creating the videos (IF you want to get views and grow your channel, that is). Who wants to put that much time into something and then just hope that people watch it? 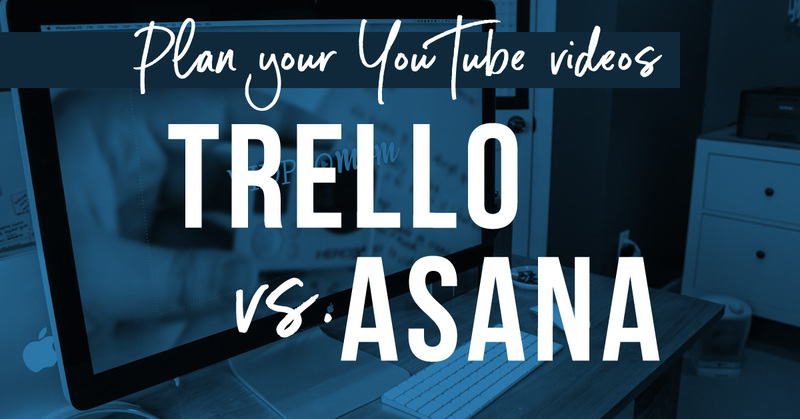 With proper research, you will know exactly how to word your YouTube title, description, and tags to optimize your video to get as many views as possible. Without the research, it’s a shot in dark… you’re just swinging the axe hoping to hit something (and that sounds dangerous!). I have been a big fan of TubeBuddy for a while, and I still am but there is this new tool called Morning Fame (aka Morningfame) and it’s kind of mindblowing! Let’s get to this game changer in a Morning fame review below. Since Morning Fame is a new keyword tool for YouTube, it is continuously in development and being improved. 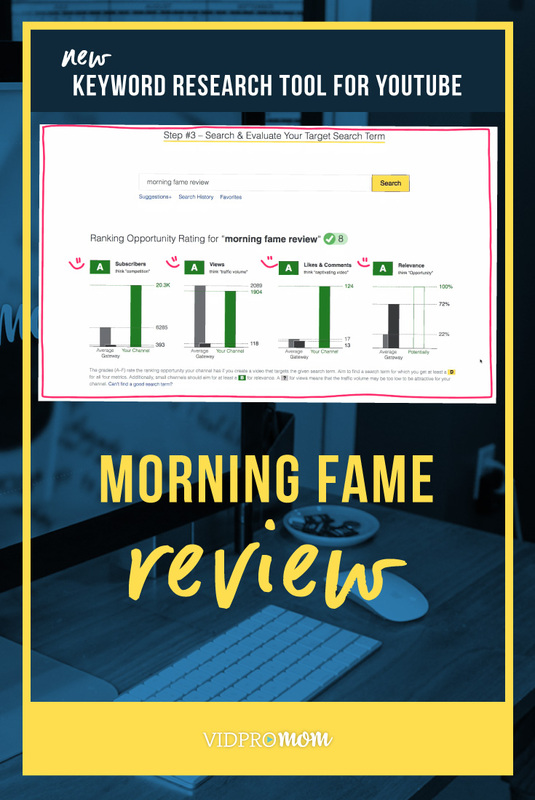 To make sure you get the most up to date information about what Morningfame is capable of, be sure to create an account and claim your 30-day free trial by using my Morning Fame invitation code “vidpromom” (or click here to claim the code now). Keep reading for a link to a more indepth Morning Fame review video. I heard about Morning Fame a few months ago and basically what it is, quite simply, is smarter analytics for YouTube. In fact, that is Morningfame’s tagline! YouTube analytics can be a bear to digest sometimes, especially if you are a visual person like me. One thing that has always bothered me about the analytics in YouTube is that you can go super in depth, but you can’t just look at it and instantly get an overall “feel” of how things are going RIGHT now. How are your newest videos performing? And what does “performing” even mean? And how do they compare to the rest of your videos… what kind of impact are they making on the rest of your channel? I don’t know about you but these are some of the things I wonder about, but never seem to find an answer to in YouTube’s analytics. That’s one of the things Morning Fame is really good at. In my short Morning Fame review video, you can see that Morningfame breaks things down AND it gives you a visual indication of what it all means. Look at the graphic above. I have Z’s here, a green checkmark, and a gold medal. There is a legend at the bottom of the page that tells you what all the symbols mean (emojis have been added for effect, hehe), but I can tell you Zzz’s are not a good thing! Another thing that Morning Fame makes really interesting is planning new videos. You can use Morningfame to help figure out what topics you could create videos about will perform well. With the Keyword planning tool you go step by step and you actually learn what’s going on and why it takes you down these paths as you go. You can either put in a new topic idea and start researching that, or it gives you some clues about which of your videos have done so well that you might consider making more videos related to those ones. It also shows you other channels that might relate to yours and gives you some topic ideas based on what has been working for them. In this case, let’s research the topic of the video I’m making right now. 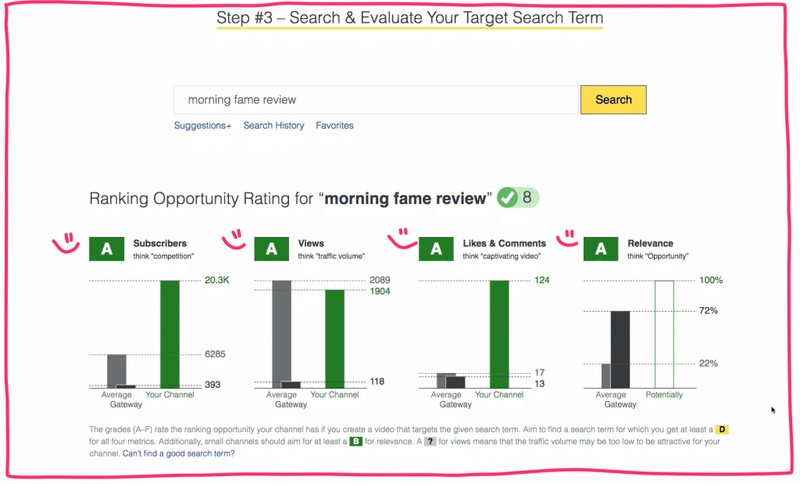 Nick Nimmin has a great video walking through this process of keyword research in Morning Fame, so I’m not going to dive too deep into that here. I LOVE that you can save all your research once you get to the 4th stage, and when you’re ready to upload your video you have it all right there, where you can copy and paste it into youtube. Now for my favorite thing about Morning Fame: the 24 Hour Report! This is so cool. 24 hours after you upload a video, Morning Fame will email you a report on how it’s doing! Love seeing those graphs! 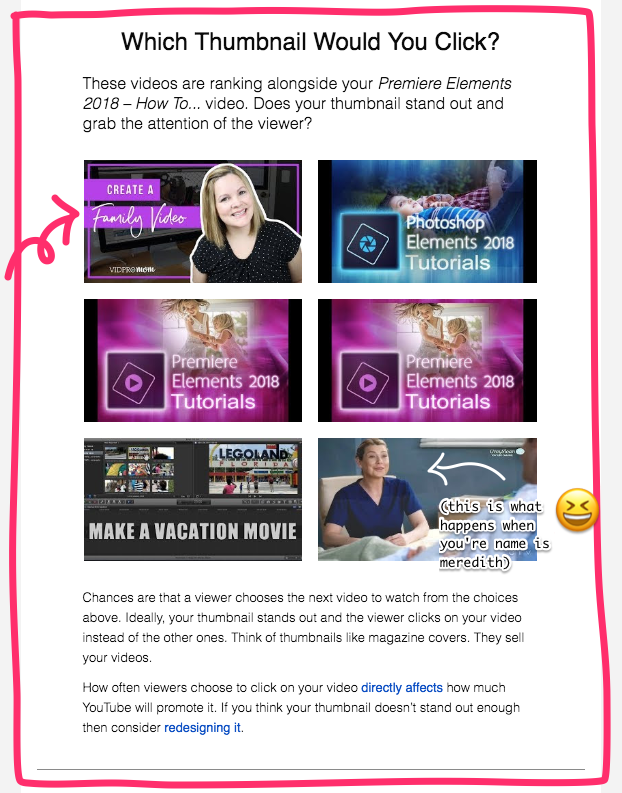 And this is my favorite part of the email… It shows you what your thumbnail looks like compared to other thumbnails for videos related to the same topic! Again, if you’re a visual person like me, this is like really interesting! 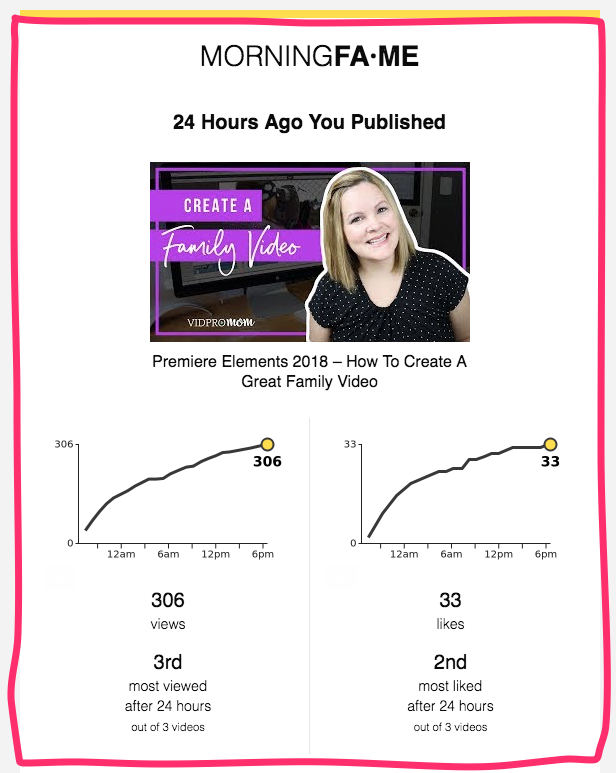 There is so much more to Morning Fame that I haven’t even explored yet, and I am confident it will help me improve my YouTube channel and create better videos, which is ultimately, my audience benefits from. You are probably wondering how much Morning Fame costs, right? There are two pricing tiers currently, and there is value in both tiers. When you join the early access program using my link, you will find the options for subscribing once your 30-day trial is up. You can subscribe for as little as $4/month or go big for max total of a whopping $9/month. Of course, I am being sarcastic… the value of Morning Fame truly does far outweighs the cost. I subscribed to the yearly subscription and then upgraded to the plus plan when that became available. As of the time of this writing, Morning Fame is invitation only, but don’t worry! I have an invite code for you! If you need a Morning Fame invitation code, just type in “vidpromom” in the invite code box on morning fame’s website. Alternatively, you can use my morningfame invite code at http://vidpromom.com/morningfame. When you use my code, you get 30 days free and so do I! Morning Fame is just a really fun and interesting way to look at your videos, your channel, and your future videos. There is almost a gamification sense to it with all the checkmarks and badges… it’s fun and so, so powerful if you put in the work to research and then to actually create the videos.